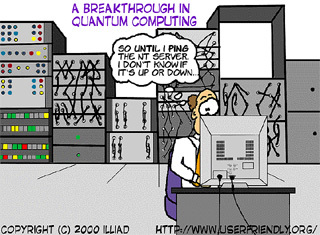 Course Description: An introduction to and survey of the field of quantum computing. Quantum computation is an emerging field whose goal is to design effectively atomic sized computers which exploit the parallelism of the quantum mechanical laws of the universe. While this sounds futuristic, quantum computers are fast becoming a reality, and have the potential to revolutionize computation over the next twenty years. Topics include quantum algorithms, quantum error correction, and quantum information. This course will give you the knowledge to understand why quantum computers can break certain public key cryptosystems, the engineering challenges in building a physical quantum computing device, and the level of security assured by quantum crytopgraphic devices. Prior knowledge of quantum theory is not necessary.